Last time I wrote about “Product Innovation in Food Service “, a heavy subject for me as I usually write about food, gin or holiday visits. So this time I’m returning to my favourite spirit of choice gin! The popularity of gin and the “explosion” of small batch distilleries producing artisan brands have significantly changed people’s drinking experience with this spirit. A work colleague of mine recently told me that they had joined a gin club – wow, I thought, now that’s a club I have to join. So I have! It’s called the Craft Gin Club http://www.craftginclub.co.uk/ the concept was pitched at Dragons Den by two guys Burke and Hue who received backing from restaurant magnate Sarah Willingham. The cost of membership is £40 per delivery which you can have monthly, bi-monthly or quarterly. Naturally I went for the monthly option! Although an indulgence, I rationalised it by convincing myself that I don’t often treat myself! 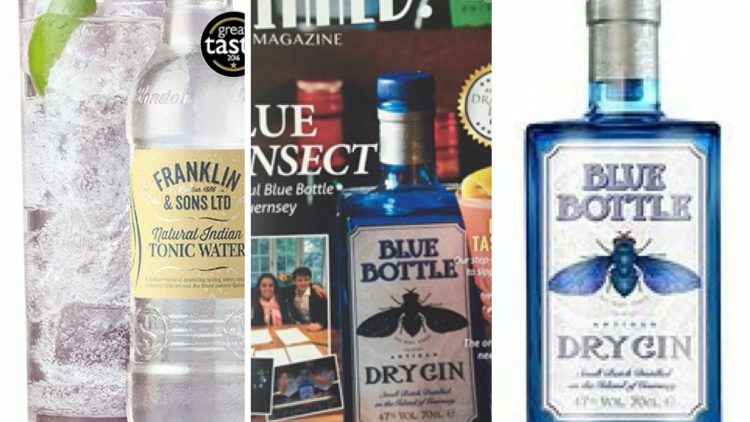 With each delivery the club member receives a surprise box featuring a bottle of craft gin, together with mixers, cocktail ingredients and a club magazine. Blue Bottle Gin is distilled exclusively on Guernsey. Each 400 bottle batch is meticulously crafted in a copper still at the Three Fingers Distillery. The gin has a unique combination of botanicals featuring Juniper Nutmeg and Cubeb Pepper and a small amount of locally sourced Gorse flowers. These flowers with their intense, rich coconut and vanilla aroma give this gin a unique flavour is best served with Tonic and a slice of Pink grapefruit. If you look online for this product on a well known website it’ll cost you £49! The brand is Franklin & Sons, not a brand I’ve seen before! It’s good to know there’s more to quality tonic than Fever Tree!! It achieved a 1 star rating in the 2016 Great Taste awards; this is definitely not a gin I’m sharing with my friends. In fact I’m only allowing myself one of these “bad boys” each time I fancy G&T. Reverting to a more generic brand if more is required! Hopefully this way I can make the bottle last until my next box of surprises arrives.